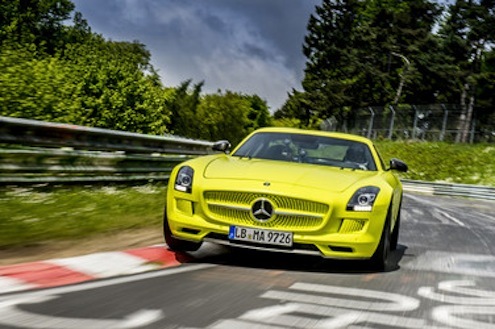 Mercedes-Benz has just pulled off an incredible feat with the all-new 2014 SLS AMG Coupe Electric Drive at the “Green Hell.”. They don’t call it the “Green Hell” for nothing. It’s twisty turns are enough to unnerve even the most experienced drivers. An English journalist who visited the Nordschleife said,“that it seemed as if a reeling, drunken giant had been sent out to determine the route”. And Formula 1 driver Sir John Young Jackie Stewart was so impressed by the circuit that he gave it the name which it will probably never lose: Green Hell (Grüne Hölle). Is this the future of high-performance cars? For those who think that an all-electric vehicle is boring, Mercedes has just proved that high-performance is here to stay in the future. Mercedes-AMG broke the record at the Nurburgring Nordschleife with the all-new 2014 SLS AMG Coupe Electric Drive with a record lap of 7:56.234 minutes. That makes the electric AMG super sports car the first electrically-powered series production vehicle to clock the legendary race track in under eight minutes. We are wittnessing the future of performance right before our eyes. AMG wanted to break the record at the most difficult race track in the world and show what kind of potential the all-electric sports car has. Ola Källenius, Chairman of Mercedes-AMG GmbH said, "Mercedes-AMG impressively shows the potential of the SLS AMG Coupé Electric Drive with the new record on the Nürburgring Nordschleife. Mercedes-AMG is the first vehicle manufacturer which makes it possible to circle the Nordschleife in under eight minutes with an electrically-powered series production vehicle. This record run is another proof for our constant innovative vigor,"
The fastest electrically-powered series production vehicle will launch this month around the globe. The gullwing sports car is currently the strongest AMG high-performance car and has four electrical motors with a total output of 552 kW (751 hp) and has a maximum torque of 1000 Nm (738 lb-ft). The all-electric SLS AMG Coupé accelerates from 0-100 km/h in a lightening quick 3.9 seconds and can reach a top speed of 250 km/h (electronically limited). Power is transferred to all four wheels via a permanent four-wheel-drive system. That’s a good thing as it needed that traction to attain the record at the “Green Hell.” This enables the fastest electric-drive sports car to optimize the vehicles ability in the corners, reduces over and understeering, increases traction and reduces the steering effort needed to run through the twisty turns. Mercedes-AMG has developed the high-performance full-electric-drive sports car of the future today. If we think that performance is dead, all we have to do is look at the new gullwing sports car from AMG to see that it’s alive and well. The 2014 Mercedes-Benz SLS AMG Coupe Electric Drive is available now in Germany at a purchase price of 416,500 euros ($549,780 US) Those of us in the U.S. get left out again, but there aren’t any Autobahn’s here to fully enjoy all that power anyway. Watch Mercedes-Benz SLS AMG Coupe Electric Drive (2014) video.